Recomended by vets. We offer over 25 years experience in boarding kennels and training for dogs so you can have peace of mind that your beloved pet is well cared for. We offer over 25 years experience in boarding kennels and training for dogs so you can have peace of mind that your beloved pet is well cared for. The property is situated in a 10 acre country setting featuring a large exercise yard and individual kennels. 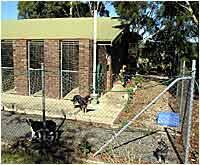 Our kennels are located a few kilometres out of Little Hampton offering a beautiful country setting. We have over 25 years of experience and dedication in providing quality care for dogs with our dog boarding and training services. For true professional, experienced training call us to discuss a training plan that will work.